Today we have the first of three releases focused in some way on Gov. Chris Christie: his ratings; New Jerseyan’s attitudes toward his presidential campaign; and a third release on perceptions of Hillary Clinton as a presidential opponent. The latter two will come out next week. 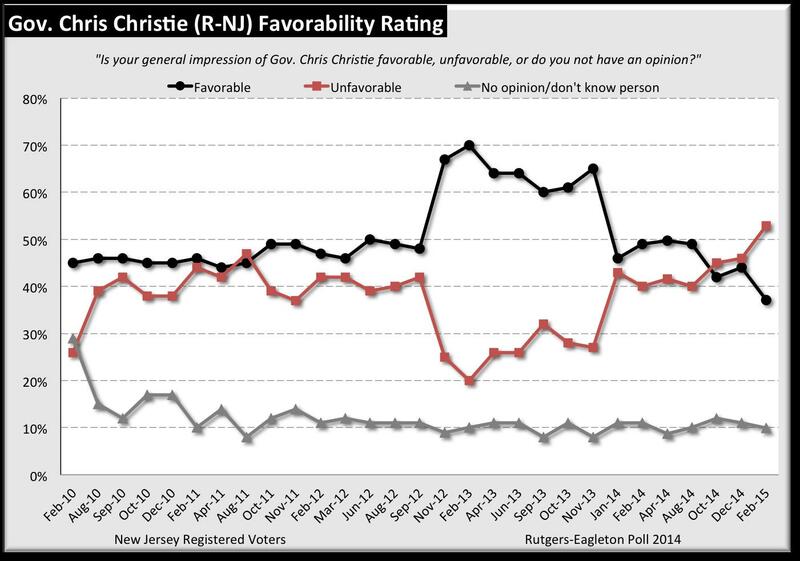 In the meantime we focus today on Christie’s ratings with NJ voters. And the story is not a good one for the governor. He has reached the lowest approval point we have recorded across his entire term, breaking through the 50% negative impressions and job approval barrier. The drop seems to be driven by a huge negative shift among independents. We also, for the first time ever, asked voters to tell us int heir own words why they think Christie’s ratings had taken a downward trend over the last couple months. The keys? His personality appears perhaps to be wearing thin on voters, the Bridgegate scandal which remains on their minds, and his focus on national ambitions, rather than on his job as governor. Sometimes it is really interesting to simply record what people say in their own terms. It certainly is here. Full text of the release follows. Click here for a PDF of the release text, questions, and tables. NEW BRUNSWICK, N.J. – As Chris Christie attempts to build a following among national Republicans in preparation for an expected 2016 presidential bid, New Jersey voters have soured on the governor, according to the latest Rutgers-Eagleton Poll. Following a recent spate of damaging headlines, Christie’s support has collapsed to just 37 percent of registered voters reporting a favorable impression, down seven points in just two months. For the first time, a clear majority (53 percent) feels unfavorable towards the governor. His overall job approval is also clearly negative: 52 percent disapprove while 42 percent approve, a drop of six points since December. Voters have definite opinions about reasons behind the slide. Twenty percent mention his attitude, personality, and behavior; 15 percent refer specifically to “Bridgegate” and 10 percent say something about shunning his current duties to pursue presidential ambitions. Christie’s slump is reflected in specific issues as well. His job approval on taxes (the top concern for 29 percent of voters) is down three points to 28 percent since the December 2014 Rutgers-Eagleton Poll. On the economy – the most important issue for 24 percent – Christie is down four points to 31 percent approval. And what was already a strikingly low approval rating on handling the pension situation has fallen an additional five points to 19 percent. The largest decline, seven points to 35 percent, has been in respondents’ perception of how he has been handling education. Only approval levels on Sandy recovery (55 percent, the highest of any issue), crime and drugs (48 percent), and the budget (31 percent) have remained steady since the last poll. Despite Christie’s increasingly negative ratings, voters split on whether he has been a good or bad governor: 38 percent of voters are positive, 33 percent negative, and 29 percent neutral. But voters are increasingly negative on the direction of the state: 35 percent say New Jersey is going in the right direction, while 54 percent say it is on the wrong track. A key to keeping Christie’s ratings in positive territory through most of tenure has been ongoing support provided by independent voters. But that has changed. Independent voters now are squarely against a governor they long supported, with favorable impressions falling a record-breaking 16 points since December to 31 percent. Meanwhile, the share of independent voters with an unfavorable impression grew by double digits to 55 percent. While New Jersey independents show a steep drop, Democrats and Republicans hold steady in their assessments. Democrats are at 24 percent favorable to 70 percent unfavorable, while Republicans are just the opposite, at 73 percent favorable to 20 percent favorable. Christie’s overall job approval reflects more of the same. Independents’ approval of his performance has completely flipped; just 39 percent now approve (down 13 points), versus 55 percent who disapprove (up 13 points). Just 25 percent of Democrats approve and 68 percent disapprove, while Republicans remain at 79 percent approval to 16 percent disapproval. Republicans retain their overall positive assessments of Christie, but the story varies on some key issues. While GOP approval of Christie’s performance on taxes remains steady at 47 percent, the same is not true of the economy and jobs, where his 46 percent approval rating among Republicans represents an 11-point decline. More Republicans now disapprove – 48 percent – a huge increase of 19 points since December. Christie also suffers from declines within his base on the state budget, with 55 percent now approving (down nine points), crime and drugs (down six points to 64 percent), and the state pension fund (down six points to 37 percent). Christie’s perennial “Jersey guy” personality, attitude, and behavior – a blessing in the best of times and a curse to him in the worst – is seen by voters as the top reason for his ratings decline, as 20 percent cite this when asked to explain what polls have been showing. The George Washington Bridge scandal is also high on voters’ minds, coming in a close second at 15 percent, along with an additional 4 percent who mention scandals generally. Christie’s 2016 aspirations have not been lost on voters either. His lack of attention to New Jersey as he focuses on presidential preparations is named by 10 percent, with another 4 percent specifically mentioning Christie’s “excessive” out of state travel. Some, however, believe Christie’s fall may not be entirely his fault; 6 percent of voters cite news coverage and his portrayal by the media. Others look to specific issues – 5 percent name his handling of the economy and jobs; another 5 percent reference state employees, unions and pensions. Four percent bring up general poor governing, lack of leadership, and not doing enough for the state. Democrats and independents are much more likely to reference Christie’s personality, attitude and behavior than Republicans (23 percent and 20 percent, respectively, to 12 percent). 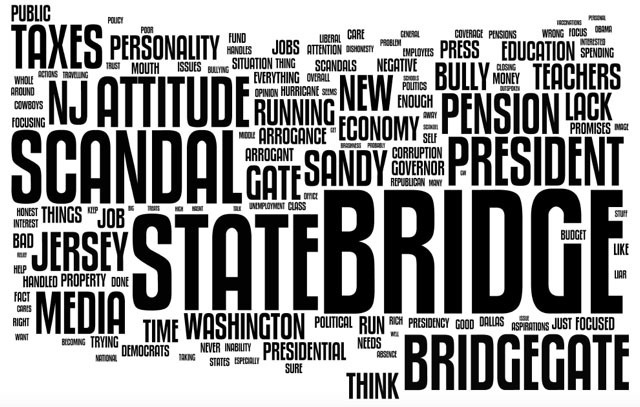 At 19 percent, Bridgegate is the top reason given among Republican voters. They are also much more likely than Democrats to blame Christie’s downfall on his portrayal in the media (11 percent versus just 2 percent of Democrats). For the most part, voters are split on how good or bad a governor Christie has been over the past five years. Independents are the most split: 35 percent say Christie has been a good governor, 34 percent say bad, and 31 percent say neither. But 69 percent of Republicans look positively on the governor’s time in office, while 24 percent are neutral; just 7 percent say Christie has been bad. Unsurprisingly, Democrats differ: 22 percent say Christie has been good, 46 percent say he has been bad, while 31 percent are ambivalent about his performance. Pingback: HUFFPOLLSTER: Americans Support Granting Obama Military Authorization On ISIS | Oh Alright! Pingback: Chris Christie's Ratings Drop To A Record Low | Oh Alright!